All French cheese (and foods, for that matter) have an "M.G." notice on the label. That is not the mg (milligram) marker, but rather "Matières Grasses" ("Fat Matter", literally). Many of the delicious cheese I love are, obviously, very high in fat. Most aged or pressed cheeses are around a quarter to just under a half (25%-45%) fat by weight. Just look on the label for the "M.G." indicator, sometimes also written "M,G" or (incorrectly and confusingly) "mg" or "Taux de M.G." which means "rate of M.G." Once in a while, you will also see M.G.P.T., which I believe means Grasses du Produit Total, or Fat Matter in the Total Product. That's because the old labeling system removed water from the equation, which resulted in misleading numbers. Now, they include the water and the total weight, so you can directly compare both dry and wet foods. 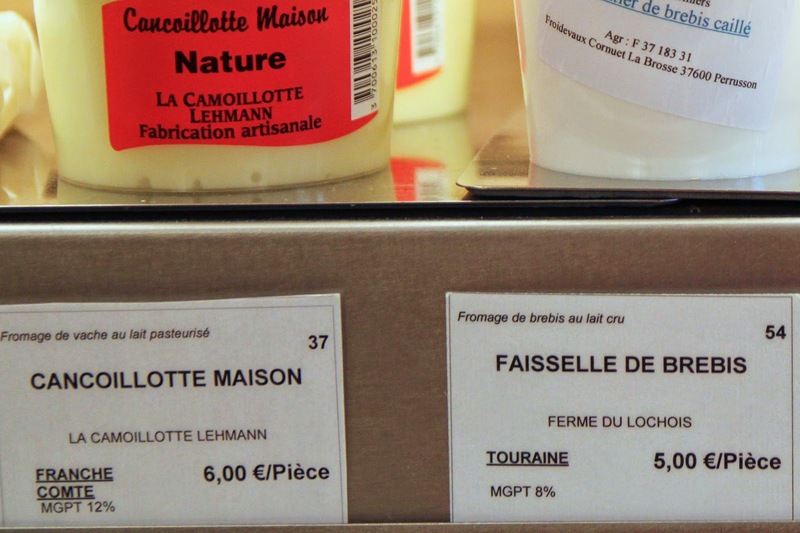 For example, a Camembert used to be labeled 45% fat, but under the new system is labeled 21% M.G. Below, the 45% on the left is the M.G. "Extrait Sec" ("Dry Extract"), and the 20% is the current system. The newer, wetter system does not seem like cheating to me, as I'm not about to sit there and dehydrate my food before consuming, so I'm happy to have it analyzed in its true state. You would think that creamy and oozy cheeses would be higher in fat than dry cheeses, but you would be wrong. Actually, the oozy cheeses have more water in them, so the percentage of fat per 100g is less. Which is not to say they're low-fat. Because fresh cheese have such a high water content, their M.G. percentage is significantly lower. If you ever see low-fat cheese -- not just a fresh cheese that is naturally lower in fat, but rather a cheese in which fat is purposely reduced, you should run the other way. I've said it before, and I'll say it again, if you want to eat cheese but are afraid of the fat, just eat less of it. But don't bother with the low-fat stuff which doesn't satisfy the good-cheese craving. Closely related to the very similar-looking Charolais from Beaujolais in Burgundy, Tonneau is also a barrel-shaped goat cheese from Burgundy. It's not only the shape that makes you think of wine-making, the word "tonneau" itself means "barrel". Tonneau is made of raw goat's milk, aged in a ventilated cellar for two-three weeks. It's a towering, thick, firm, sliceable cheese that nevertheless has that wonderfully creamy quality as it melts in the mouth. It's a very mild cheese that, to my palate, could either benefit from a dash more salt or -- at the other end of the spectrum -- a drizzle of something sweet like honey or a fruit gel. It's a hard-to-hate goat cheese, unless you hate goat cheese. Not only does the cheese have a very heavy sounding name, with "ton" as part of the word, it's also a cheese that is, as a matter of fact, very high in the matter of fat: 45%. That makes it high in fat in name, shape, and actual content. On a vaguely related note: news sources have just reported that North Korean dictator Kim Jong-un is probably suffering from gout and are directly attributing that to the fact that Switzerland exports a ton of Emmental cheese to North Korea each year, and huge cheese fan Kim Jong-un appears to be the only one eating it (it's certainly not the poor North Koreans).